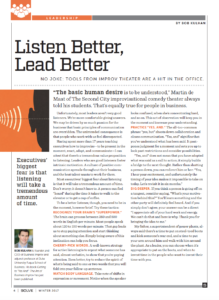 Listen Better, Lead Better - Getting to "Yes And"
“The basic human desire is to be understood,” Martin de Maat of The Second City improvisational comedy theater always told his students. That’s equally true for people in business. Unfortunately, most leaders aren’t very good listeners. We’re more comfortable giving answers. We may be driven by so much passion for the business that basic principles of communication are overridden. The unintended consequence is that people who work with us feel disrespected. Having spent more than 17 years teaching executives how to improvise—to be present in the moment, react, adapt, and communicate—I can attest that there’s a tremendous value proposition to listening. Leaders who are good listeners foster intrinsic motivation. A culture of positive communication spreads throughout their business, and the best talent wants to work for them. Most executives’ biggest fear about listening is that it will take a tremendous amount of time. Don’t worry; it doesn’t have to. A person can feel “heard” during the time it takes to walk to the elevator or to get a cup of coffee. To be a better listener, though, you need to be in the moment, however brief. Try these tactics: RECOGNIZE YOUR BRAIN’S “SUPERPOWER.” The brain can process between 350 and 500 words in English per minute. Most people speak about 120 to 150 words per minute. That gap leads us to stop paying attention and start thinking about something else. Simply being aware of this inclination can help you focus. CHERRY-PICK WORDS. A well-known strategy for active listening is to repeat what someone has said, almost verbatim, to show that you’re paying attention. Even better, try to reduce the spirit of what’s being said to one or two words that you will fold into your follow-up sentence. WATCH BODY LANGUAGE. Take note of shifts in expression or movement. Notice when the speaker looks confused, when she’s concentrating hard, and so on. This act of observation will keep you in the moment and increase your understanding. My father, a superintendent of power plants, always said there’s a time to put on steel-toed boots and kick someone’s rear end, and a time to put your arm around him and walk with him around the plant. As a leader, you can choose when it’s appropriate to put on the boots, and when to invest time in the people who want to invest their time with you.